I have exciting news. After years of trial and error (and eating too soggy or too burnt fries), I’ve finally perfected baked fries! Some key steps: cut the fries thin (about a 1/2 inch) soak the cut potatoes in water to remove some starch and then dry them really, really well; bake on the bottom rack of the oven; and turn up the heat for the last few minutes. 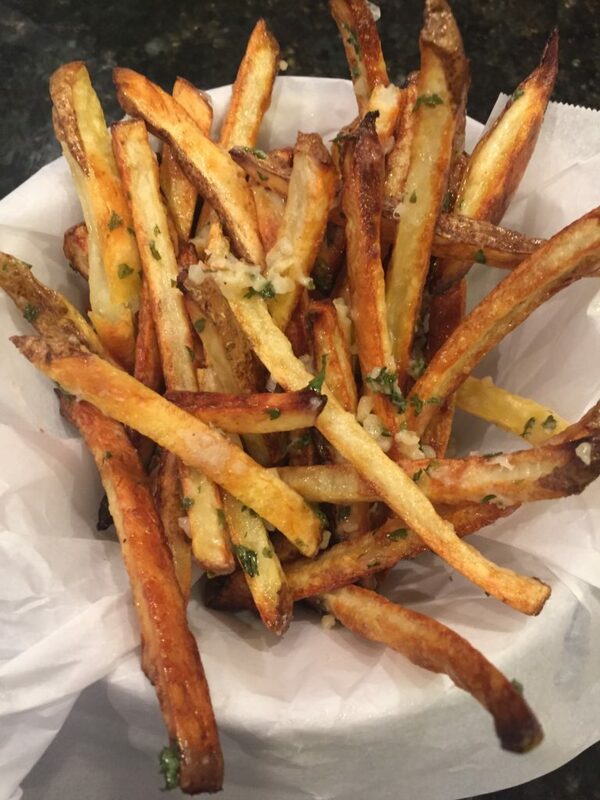 These fries would be delicious right out of the oven, but I took them a step further and tossed them with a little melted butter, garlic, parsley, and Parmesan cheese right before serving. These are just as good as any gourmet fry you get at a restaurant. After cutting potatoes, place in a bowl of cold water. Let sit for at least 30 minutes. Spread potatoes on a dish towel, and dry thoroughly. Place on a baking sheet and drizzle with olive oil and salt. Toss to coat, and spread in an even layer. Bake a 425 degrees on the bottom rack of the oven for 20 minutes, flipping with a spatula halfway through. Leave fries in oven, and turn oven up to 500 degrees. Bake fries for an additional 5-10 minutes, until golden brown and crisp. Melt butter in a microwave-safe bowl. Add garlic and dried parsley. Stir. Pour over fries and gently toss. Sprinkle with Parmesan cheese. This recipe serves two. Plan for about 1 medium potato per person, and increase the other ingredients accordingly.